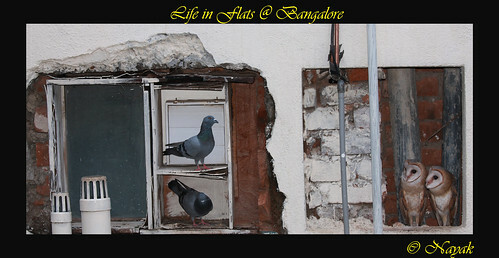 We stayed at a flat called Palm Tree Place in Victoria Layout, Bangalore, India for around 18 months. One of the highlights of that place was that a broken cove in the next building was visible from our balcony. The blue rock pegions used to use this place during the day to hide from the raptors. Even though, they were quite a nuisance, but believe me, they were too much fun most of the times. Interestingly one fine morning, I saw a Barn owl perched in one of the coves. I had never seen such a bird before in real life. I was thrilled. I started to observe them very closely. 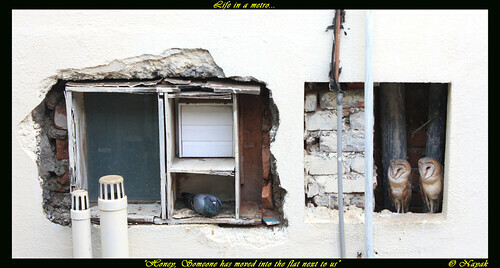 And, my happiness knew no bounds when I discovered that there were two of them and they were nesting. It is against my policy to disturb nesting birds. So, I used to observe them by hiding behind the curtains. The pegions were also having some interesting times with the Owl family growing up. I managed to get a few shots of the family when they were slightly grown-up and I felt it was okay to sneak up to take those shots. Some of them, I post for all of you. Scientists believe that the barn owl originated as a dweller in high clay cliffs of Europe and this may be one reason why the birds prefer the vertical walls of manmade structures even over trees. There may be other advantages in “owning” a barn, particularly in the winter. Long periods of heavy snow can result in high mortalities in barn owl populations since their prey is too far beneath the snow to catch. 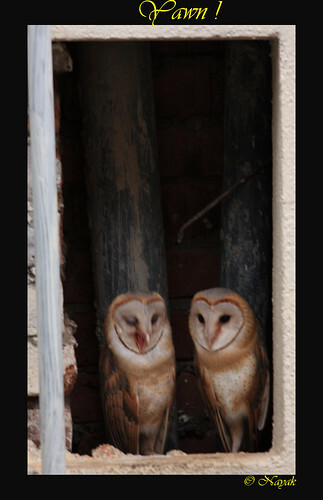 But a barn may provide an available supply of rodents during these periods, allowing the resident barn owls to survive. Highly successful, the barn owl spread through all the known continents, and morphed into 35 subspecies, some of them confined to single island chains. The two best known races are the Barn Owl of Europe, Tyto alba alba, and the North American Barn Owl, Tyto alba pratincola. They tend to habitually perch in the same spot—usually in the same area they breed, and are known to remain quite still.When they do not perch inside buildings, they most often use thickly grown evergreens and, despite their pale plumage, are exceedingly difficult to spot.They tend to be less territorial than other raptors, and numerous instances of communal nesting have been recorded, one of the most notable when over 30 birds were found living in an abandoned steel mill in Utah. They most often hunt at dusk, midnight, and dawn, but in times of hunger may hunt in broad daylight.They will often kill more than they can eat and stockpile food for later.Barn owls produce about two pellets per day. These are the indigestible parts—the fur and bones of the animals they eat, compressed into an oblong shape in their cropIn some areas of the world, barn owls prey primarily on bats, birds, insects, and lizards, and have been seen successfully hauling fish from lakes and streams. 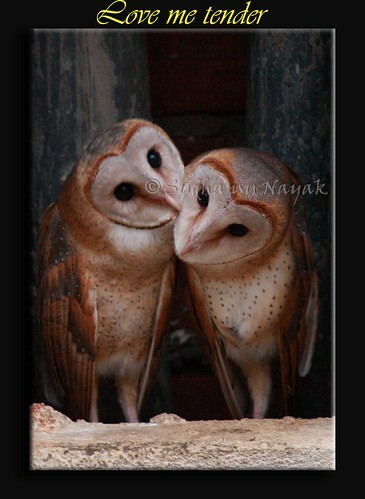 In North America, the barn owl inhabits almost every state. Prior to European settlement, barn owls were rare in the northern states, but as the forests were cleared for farmland, the barn owl became a common frequenter of barns and farmlands. Since the 1950’s, barn owl populations have declined in many northern states. This is due to a variety of factors including the destruction of grasslands and wetlands, the replacement of wooden barns by metal barns, and the practice by modern farmers to do away with hedgerows and wild areas on their farms.Now, many states are attempting to bring back their grasslands and wetlands, and the barn owl may very well start recovering in these areas. 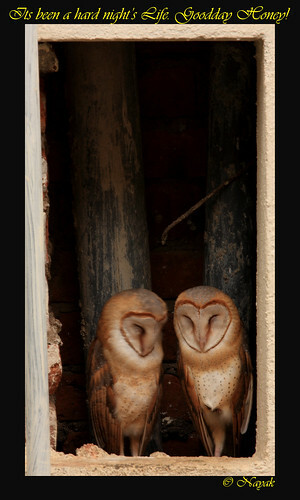 The erection of nest boxes is an important part of barn owl conservation efforts. This is really cool. 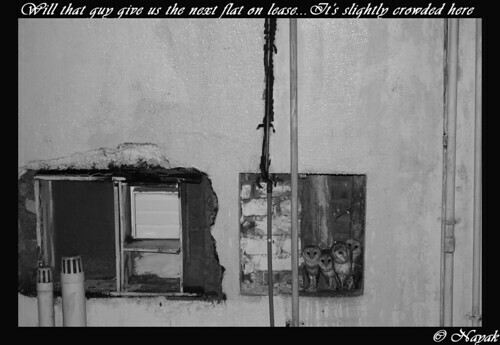 Came across this post because there are barn owls in my building in Koramangala.